Embracing nature's imperfections. Long may they live. Congratulations to our lucky winner, Tori! Denim rugs are great for the same reason you love your favorite pair of jeans — they go with nearly anything, and they wear really well! Nearly all of the rugs from Annikki's Weaving Studio are from recycled materials — old clothing, sheets, or other household fabrics. This rug, which measures 34.5 by 29.5 inches, is made from jeans too worn for wear anymore, but still with a lot of good fabric in them. 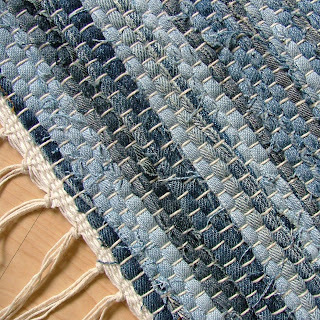 The jeans are cut apart and into strips using scissors and a manual strip cutter; then the strips are sewn together using a treadle sewing machine. They are then hand-woven on a handmade antique loom. The only electricity used to make these rugs is the light to sew by and the radio for a little music to weave by! 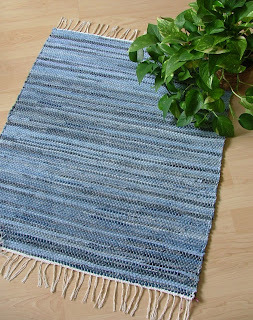 I am seriously coveting this beautiful rug that Annikki's Weaving Studio has generously contributed, but unfortunately for me and lucky for you- it's for the giveaway! Here's How to Enter for Your Chance to Win! Visit Annikki's Etsy shop and look at her other beautiful creations. Comment on this post telling me which item you would love for your home. But wait- you can get more entries! One extra entry for following my blog. Leave a comment telling me. 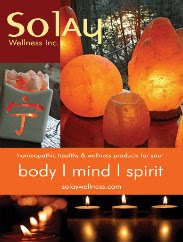 One extra entry for subscribing to my blog via email (upper right of page). Leave me a comment telling me. One extra entry for telling a friend about this giveaway. Leave me a comment telling me you did. TWO extra entries for blogging about this giveaway, linking back to me and Annikki's Weaving Studio. Leave me TWO comments telling me you did and giving the link to your post. TEN extra entries for making a purchase from Annikki's Weaving Studio before June 5th. Leave me one comment telling me you did and what you bought. Don't forget to leave your email address in each comment so I know who to contact if you win! This giveaway ends on June 5th at 11:59 pm CST. I will contact and announce the winner on June 6th. If the winner does not contact me by June 9th, 11:59pm CST, I will choose another winner. I love it all! I especially like the denim takes two rug. The colors pull me in. What a great idea! I just subscribed to your blog. I have read it every day this week and love it! I became a follower, woohoo! My 4 year old daughter would freak out over the zebra pink rug. Awesome! the denim rug is pretty awesome. I also love the hand knit wool socks. Sound comfy and warm! I like the olive branch rug. The time for checkers one is fun! I bet that was a hard one to weave! We're doing different colored blues in the bedroom and I think this would work well at the end of the bed. The PROPER BLUE is gorgeous too. I like the colors in the Summer Shades runner. Very cheerful! i love the TRAIL MIX -- Hand-woven green and multicolored rug. Annika's got quite the talent. I love the Scandinavian Handknit mittens. And I now follow your blog on google reader. I like the traditional woven rug, it reminds me of the mexican blanket I used to have as a kid! The comfy flannel pink/peach rug looks great. I think my favorite in the shop right now is the Bright Green rug in Diminishing Colors-- but then that leaves out the knitwear! Arg, it's all such solid, appealing work! And I do want that denim rug-- I know just where I'd use it! Love the MODERN WAVE -- Hand-woven gray rug with gradated teal and turquoise design. I like Little Blue. So very pretty! I love the giveaway rug itself, but I also love the Lakeside blue rug. I follow you via Google Reader. Thanks! I love the Zebra Pink rug! It would be the perfect starting point for our planned Big Girl room redo for my daughter. I love the Sweet Stripes rug. Love the modern waves rug! I love the vertical prairie rug; the colors are gorgeous. Thank you for this giveaway! I love the chevron texture of the pink rug! zebra pink rug would look awesome in my pink bedroon! May Canadians enter? I love the Cloud Walking rug. I LOVE the pink Zebra rug for my little girl. I love the Zig Zoof Rug in the blue and white.. so pretty.. Very talented. I really like this rug as well. PROPER BLUE -- Hand-woven blue and white rug with block stripes. I really like the COMFY FLANNEL -- Hand-woven pink / peach and multicolored rug. That would look great on my floor. Thank you! I like the scandinavian style runner. I like the Cloud Walking rug. Very nice. Thanks for sharing the gorgeous denim rug. I just love it. I would love the MODERN WAVE rug to throw down at my beach house!!! I like the Green and Bright Rug! I like her SWEET PINK -- Hand-woven cozy light pink rug. My email is linked to my name. I love the rug called Pink Beauty! After looking over the site I find the denim is my absolute favorite. She has lots of other great rugs though. I like the MODERN WAVE -- Hand-woven gray rug with gradated teal and turquoise design. I also love the denim rug as well. Thanks for the opportunity. The pink rug would look great in my daughter's room. LAKESIDE BLUE is my pick! I emailed my sister about your giveaways. I love the Blooming Wall ryijy (rya) wall hanging! So beautiful. I like the Vertical Prairie Poppana Art Wall Hanging. I would love to have the Hand-woven black and white rug in diminishing colors design in my home! I love the pink zebra rug, very cool! I like the sweet pink rug! I like the Hand-knit Scandinavian red and white mittens. I would love PINK BEAUTY -- Hand-woven small pink and white rug or runner for my home!!! Wow, all outstanding, but I really love the blue shag rug, as well as the giveaway - how generous! I'm a fan of the SWEET PINK -- Hand-woven cozy light pink rug! Thanks for the chance. I would love the green standard issue rug for my front porch seating area.Thanks for the giveaway. My favorite is the VERTICAL PRAIRIE -- Poppana art wall hanging. Please enter me - Thanks! Annikki sure does a wonderful job. My favorite would be the Cloud Walking Rug. love, love, love that big teal-green rug! Love your rugs! The pink beauty really caught my eye. Thanks for the wonderful giveaway. I actually like the one being given away the best. I think it has the right shades of blue to go perfectly in one of my rooms. I mentioned this contest to my sister in case she wanted to get an entry in as well. Super Green Giveaways End Soon! FuzziBunz Perfect Size Cloth Diaper Giveaway! 3 Reusable Bag Combo Giveaway from TuckerBags! Free Decorating E-Book from The Nester!